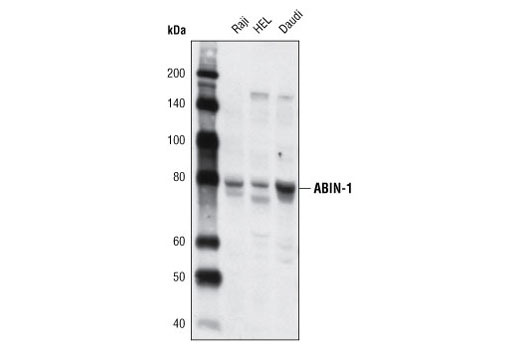 Western blot analysis of extracts from Raji, HEL and Daudi cells using ABIN-1 Antibody. Western blot analysis of extracts from 293T cells, mock transfected (-) or transfected with mouse ABIN-1 (+), using ABIN-1 Antibody. 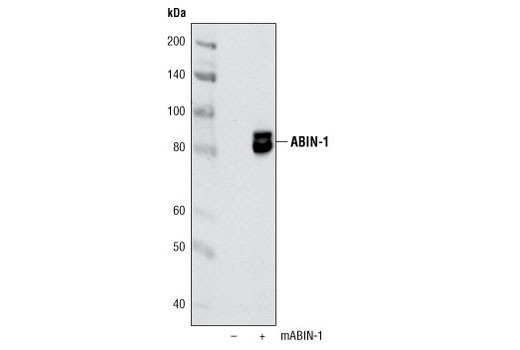 ABIN-1 Antibody detects endogenous levels of total ABIN-1 protein. Polyclonal antibodies are produced by immunizing animals with a synthetic peptide corresponding to residues near the amino terminus of human ABIN-1 protein. Antibodies are purified by protein A and peptide affinity chromatography. The ABIN family (ABIN-1, -2, and -3) is a group of adaptor proteins that associate and cooperate with A20/TNFAIP3 (1), a ubiquitin editing protein that inhibits the key inflammatory transcription factor NF-κB (2-4). Mechanistically, A20 acts by regulating the ubiquitination of the kinase RIP, which leads to inhibition of the IKK complex (5). ABIN-1 (Naf1/TNIP1) was identified based on its binding to A20 (6), as well as the HIV protein Nef-1 (7). Overexpression of ABIN-1 inhibits NF-κB activation by a number of stimuli including TNF, IL-1, and LPS. It is widely expressed and can be induced by NF-κB, providing a negative feedback loop of NF-κB signaling. In addition to binding to A20, ABIN-1 can function on other key components of NF-κB signaling including IKKγ/NEMO (8) and NF-κB family members p100 and p105 (9), and can also inhibit ERK signaling (10). Knockout mice of ABIN-1 are embryonic lethal, with fetal liver apoptosis, anemia and hypoplasia (11). ABIN-1 deficient cells are hypersensitive to TNF-mediated apoptosis. Verstrepen, L. et al. (2009) Biochem Pharmacol 78, 105-14. Beyaert, R. et al. (2000) Biochem Pharmacol 60, 1143-51. Lee, E. G. et al. (2000) . Science 289, 2350-2354. Dixit, V.M. et al. (1990) J Biol Chem 265, 2973-8. Wertz, I.E. et al. (2004) Nature 430, 694-9. Fukushi, M. et al. (1999) FEBS Lett 442, 83-8. Mauro, C. et al. (2006) J Biol Chem 281, 18482-8. Cohen, S. et al. (2009) Biochem Biophys Res Commun 389, 205-10. Heyninck, K. et al. (1999) J Cell Biol 145, 1471-82. Zhang, S. et al. (2002) Biochem Biophys Res Commun 297, 17-23. Oshima, S. et al. (2009) Nature 457, 906-9.